This is Jack Skellington’s house interior and large scale background painting from the 1993 stop motion musical, The Nightmare Before Christmas. Produced by Tim Burton, this film tells the tale of the Pumpkin King, Jack Skellington (Chris Sarandon and Danny Elfman), who has grown bored with the same old Halloween routine. When he stumbles upon Christmas Town and finds a world of cheer, he devises a plan to take over the role of Santa and spread his own version of joyful holiday terror. This stunning collection of interior pieces includes Jack’s Bed, bookcases, ladder, Christmas Tree, Chalkboard, Walls/Floor, Stairs, Zero’s bed and bowl, tables/chairs, and many other pieces. Along with the interior of Jack’s house also has and screen used painting of the Halloween Town sky behind it. The painting can be seen when everyone is heading to Halloween Town's Town Hall for the Meeting Jack requested and the painting was used in many of Tim Burton's promotional photographs when he is posing with the puppets. 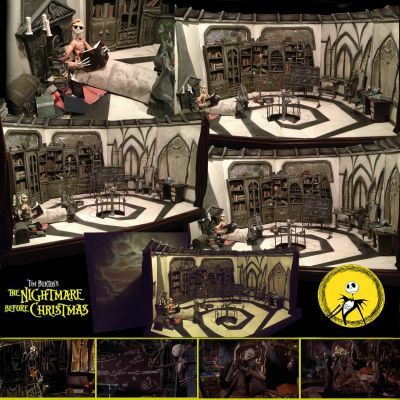 This particular collection of set pieces from one film set is believed to be the largest collection in private hands and a fantastic look into the world of Tim Burton’s stop motion classic. Site contents copyright Wicked Props unless noted otherwise. All rights reserved.